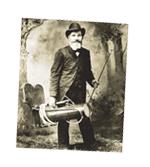 Snap-on Equipment’s heritage began with a retired inventor named John Bean, and his founding of the John Bean Spray Pump in 1904. 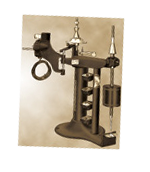 John Bean engineers continued to innovate and in 1934 introduced the first dynamic wheel balancer. In 1947, the John Bean Visualiner became the first optically based alignment system in the world and quickly became the standard of the industry. In 1987 the John Bean Signature Series model 9909 became the first alignment machine with built-in training systems for the operator. The company’s engineers continued to be at the forefront in developing and applying new technologies to the wheel service equipment industry. The Snap-on innovative heritage continues to bring the world’s most valued productivity solutions to market, an example being the seven years of intensive research and development that resulted in the introduction of three-dimensional Imaging Alignment technology using digital cameras and high speed computing. This innovation has completely revolutionized Wheel Alignment service. Our Imaging Alignment technology allows today’s technician to obtain alignment readings in under 2 minutes! 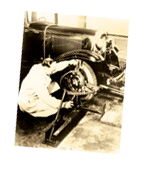 The tradition of being the first to apply new technologies to meet the needs of the automotive service industry is as alive today as it was in 1925 when John Bean introduced the world’s first wheel aligner.